Nifty started the day on a flat note but went down more than 1.2% to end below the psychological level of 5600 after 26 trading session, largely due to RBI keeping key policy rates unchanged and also lowered GDP forecast in its half yearly monetary policy review. The index ultimately closed shop at 5597.90 a huge loss of 67.70 points. 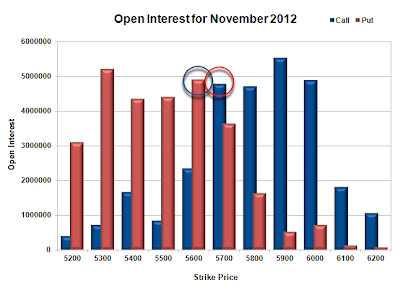 The OI Table saw huge addition at 5600 and 5700 CE levels. Call option 5600-6000 added 51.94 lacs huge amount of OI with some profit booking seen at 6100 and above strike prices. Put Option 5600-5300 added 19.79 lacs huge amount of OI with huge short covering seen at 5700 and above strike prices. Highest accumulation on Call option 5900 at 55.4 lacs & 6000 at 49.0 lacs whereas Put option 5600 at 49.0 lacs & 5500 at 44.2 lacs. 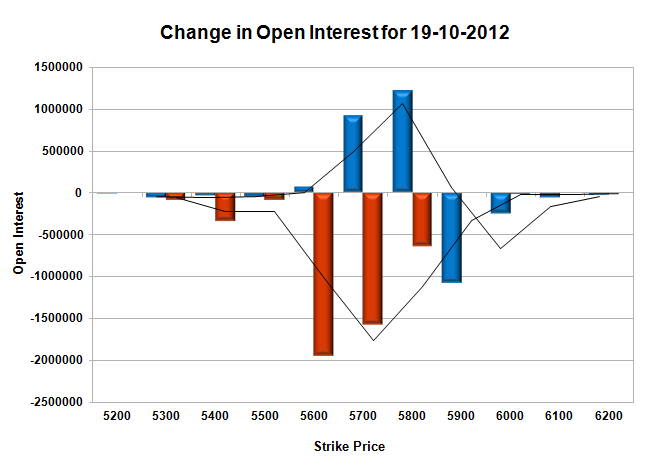 Nifty Open Interest is at 1,79,13,000 up by 91,150 with huge decrease in price, most probably short build-up. 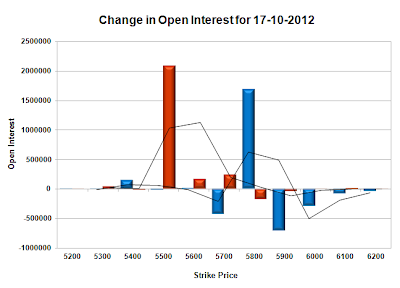 Bank Nifty Open Interest is at 11,14,625 up by 73,575 with huge decrease in price, most probably short build-up. FII’s sold huge 11.51 lacs of Futures, most probably long liquidation, as their net OI also decreased by 7.19 lacs and their average price per contract comes to around 4867. FII’s future open contract as on date is 379422. 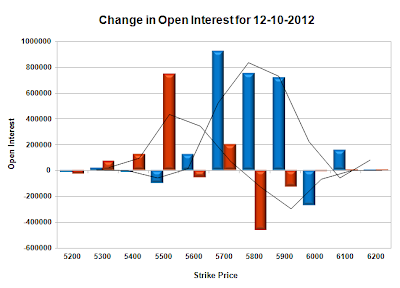 PCR Open Interest (Volume) crashed down to 1.028. The best support still very much at 5600, with highest OI of 49.01 lacs. Initial resistance now at 5700, with huge addition for the day at 13.95 lacs and above that at 5800-5900 with OI above 47 lacs. 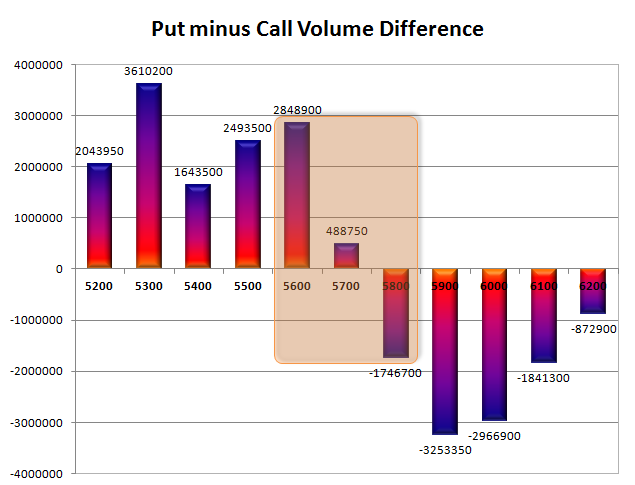 Range as per Option Table is 5573 -5666 and as per VIX is 5553 - 5642 with 5630 as the Pivot. Nifty opened the week on a flat note but made a dash towards 5700 which was promptly sold off to the lows of the day at 5645. The index ultimately closed shop at 5665.60 a miniscule gain of 1.30 points and a DOJI for a candle. The OI Table saw huge addition at 5700 and above CE levels and 5700 and below PE levels. 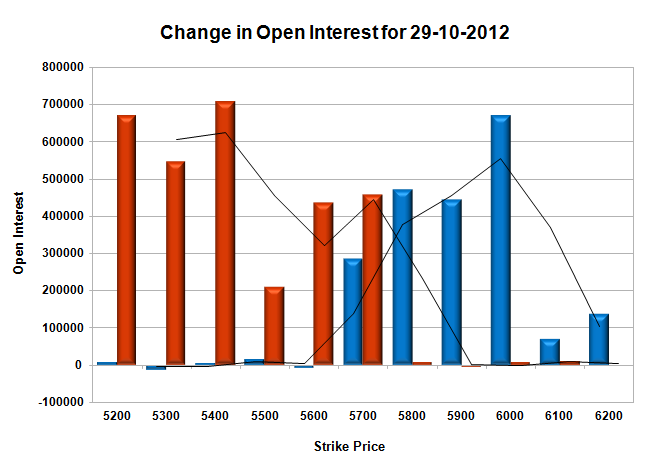 Call option 5700-6200 added 20.71 lacs huge amount of OI with small liquidation seen at 5600 and lower strike prices. Put Option 5700-5200 added 30.17 lacs huge amount of OI with small liquidation seen at 5900 and above strike prices. 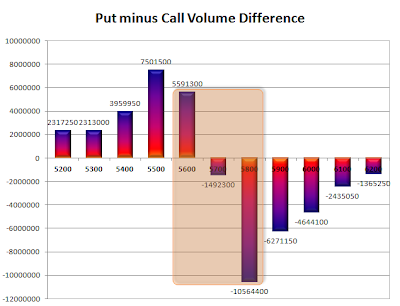 Highest accumulation on Call option 6000 at 43.6 lacs & 5900 at 42.3 lacs whereas Put option 5600 at 45.0 lacs & 5700 at 40.5 lacs. 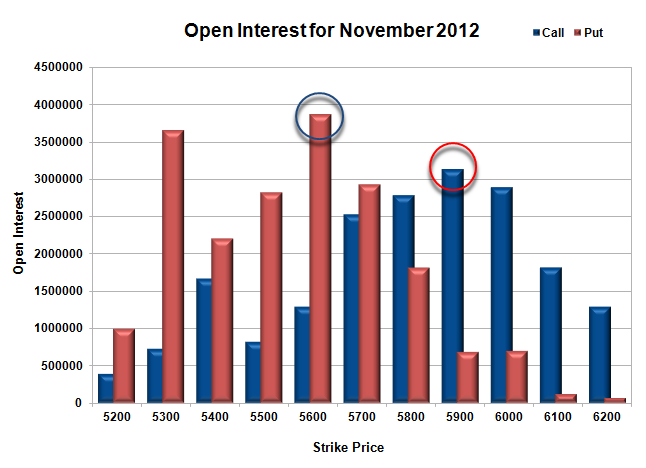 Nifty Open Interest is at 1,78,21,850 down by 1,62,650 with no change in price, most probably long liquidation. 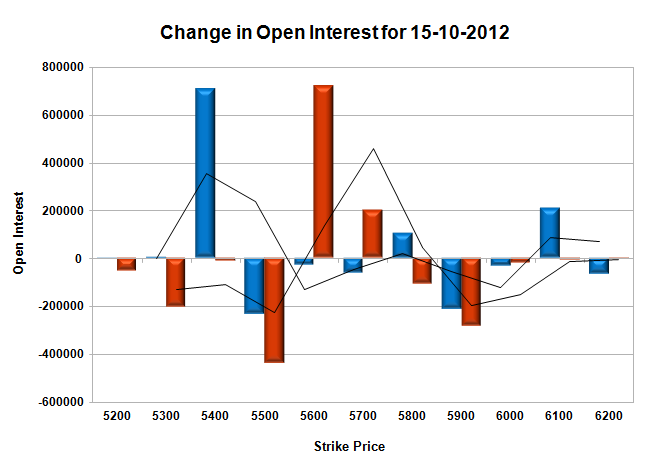 Bank Nifty Open Interest is at 10,41,050 up by 19,050 with decrease in price, most probably small short build-up. FII’s sold huge 2.29 lacs of Futures, most probably long liquidation, as their net OI also decreased by 3.56 lacs and their average price per contract comes to around 4958. FII’s future open contract as on date is 393795. PCR Open Interest (Volume) is moving up, and now at 1.156. 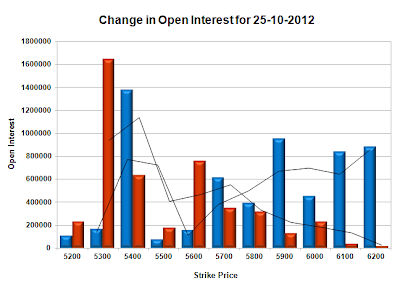 The support which is getting better is at 5600, with highest OI of 44.97 lacs. Initial resistance at 5800, with OI of 39.1 lacs and above that at 5900 with OI of 42.3 lacs. Range as per Option Table is 5625 -5716 and as per VIX is 5620 - 5710 with 5685 as the Pivot. The day after Expiry saw Nifty opening flat to negative and selling off to the lows of the day around 5640 but late buying saw the index close at 5664.30 a loss of 41.00 points. On a week on week basis Nifty lost 19.95 points or 0.35%. The OI Table saw huge addition at 5700 and above CE levels and 5700 and below PE levels. 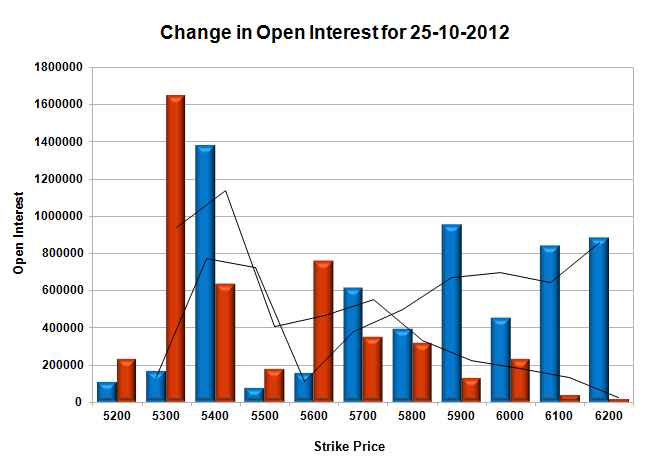 Call option 5700-6100 added 28.54 lacs huge amount of OI with small liquidation seen at 5600 and lower strike prices. 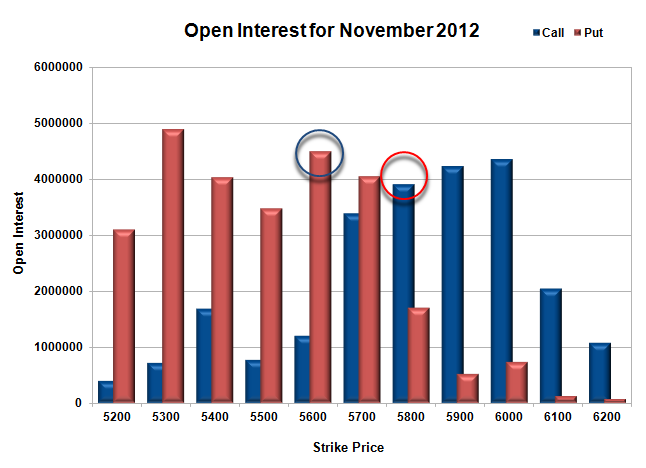 Put Option 5700-5200 added 45.63 lacs huge amount of OI with small liquidation seen at 5800 and above strike prices. 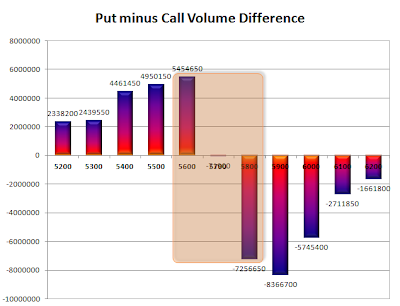 Highest accumulation on Call option 5900 at 37.9 lacs & 6000 at 36.9 lacs whereas Put option 5600 at 40.6 lacs & 5700 at 35.9 lacs. 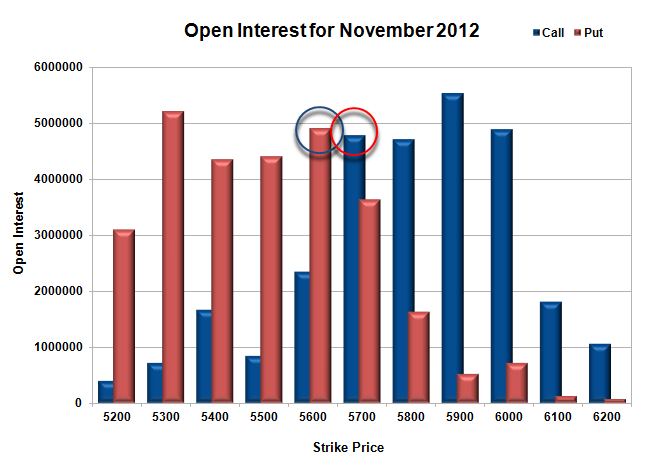 Nifty Open Interest is at 1,79,84,500 down by 72,050 with decrease in price, most probably long liquidation. Bank Nifty Open Interest is at 10,22,000 up by 1,200 with decrease in price, most probably small short build-up. FII’s sold huge 6.47 lacs of Futures, most probably some long liquidation and some short build-up, as net OI also decreased by 2.58 lacs and their average price per contract comes to around 4965. 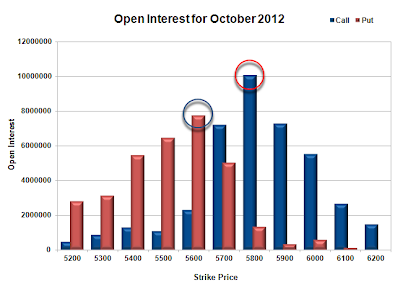 FII’s future open contract as on date is 400910. 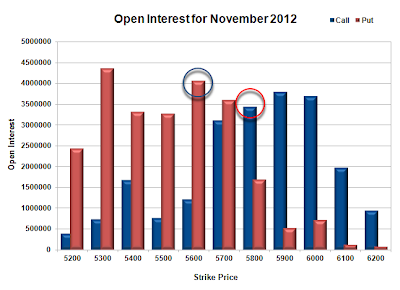 PCR Open Interest (Volume) at start of series is just above 1.015. The best support still at 5600, with highest OI of 40.6 lacs. 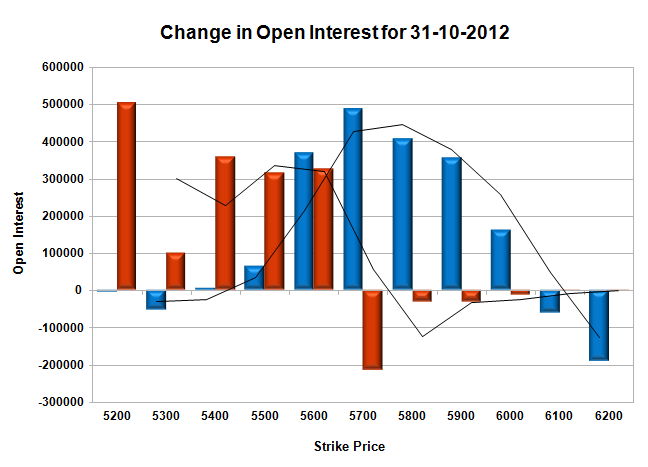 Resistance at 5800, got better with huge addition for the day at 6.59 lacs and above that at 5900 with OI of 37.9 lacs. 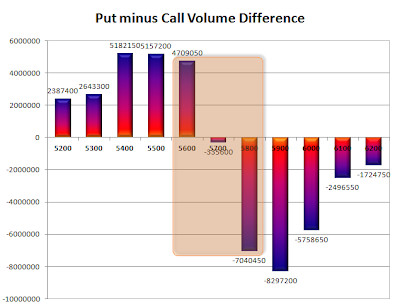 Range as per Option Table is 5623 -5714 and as per VIX is 5622 - 5706 with 5685 as the Pivot. 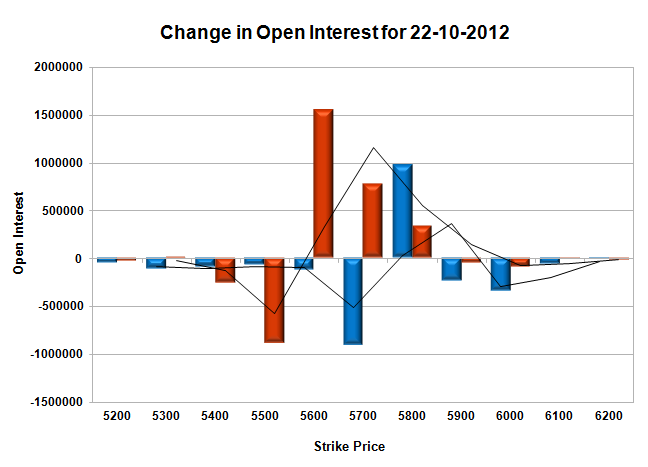 Expiry saw Nifty opening flat and staying in a very narrow range but with positive bias. The index ended the day at 5705.30 a small gain of 13.90 points. Nifty Open Interest added around 1.58 crore in the last 5 days at an WAP of 5696. The OI Table saw huge addition at each and every strike price with initial range of 5600-5900 for the time being. 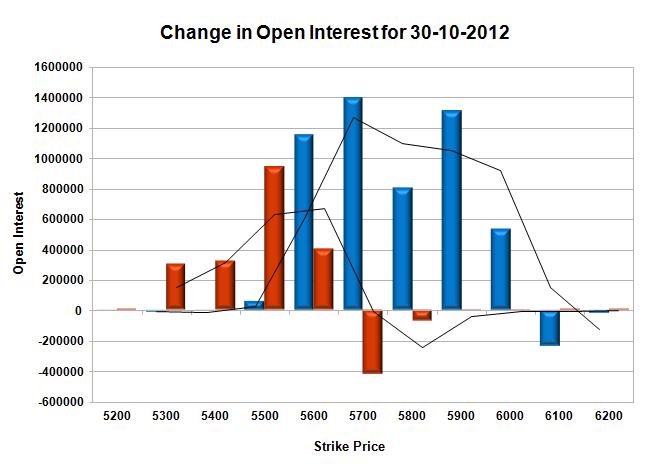 Call option 5200-6200 added 59.91 lacs huge amount of OI. Put Option 6000-5200 added 44.69 lacs huge amount of OI. Highest accumulation on Call option 5900 at 31.3 lacs & 6000 at 28.9 lacs whereas Put option 5600 at 38.6 lacs & 5700 at 29.2 lacs. 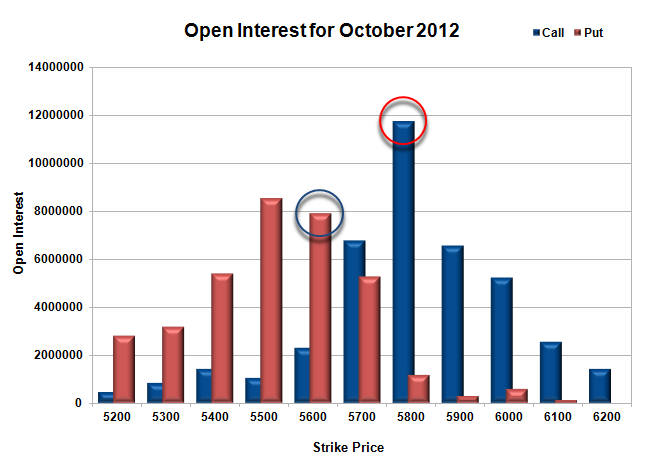 Nifty Open Interest is at 1,80,56,550 up by 34,16,750, most probably 100% rollover with some long build-up. 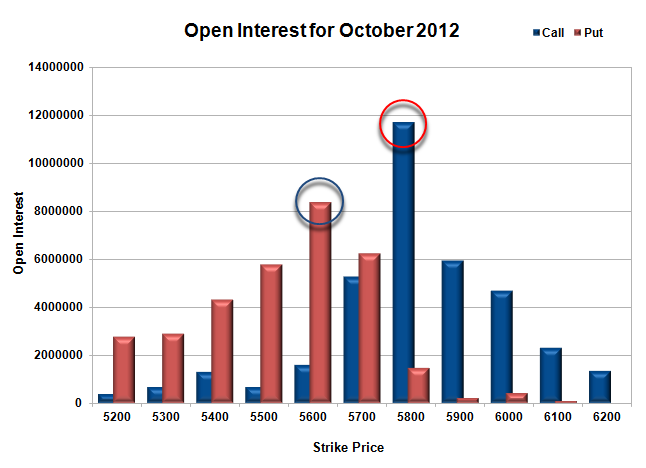 Bank Nifty Open Interest is at 10,20,800 up by 3,85,350, most probably 100% rollover with huge long build-up. FII’s bought huge 15.55 lacs of Futures, most probably long build-up, and their average price per contract comes to around 5010. 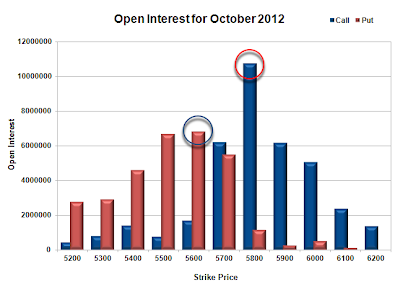 FII’s future open contract as on date is 406068. Huge Support building up at 5600, with highest OI of 38.6 lacs. Resistance right now at 5800 with OI of above 27.8 lacs and above that at 5900 with OI of 31.3 lacs. Range as per Option Table is 5657 -5751 and as per VIX is 5665 - 5746 with 5705 as the Pivot. Nifty opened weak on negative global cues, but steadily gained momentum and the responsive buyers took control to move the index into positive territory and a psychological close above the 5700 level. Nifty closed around the high point of the day at 5717.15 a good gain of 32.90 points or 0.58%. The OI Table saw the Bulls getting back with huge addition at 5700 and 5600PE level, whereas only addition in CE was seen at 5800. Call option 5800 added 9.80 lacs huge amount of OI, with huge liquidation seen at 5700 and below strike prices. 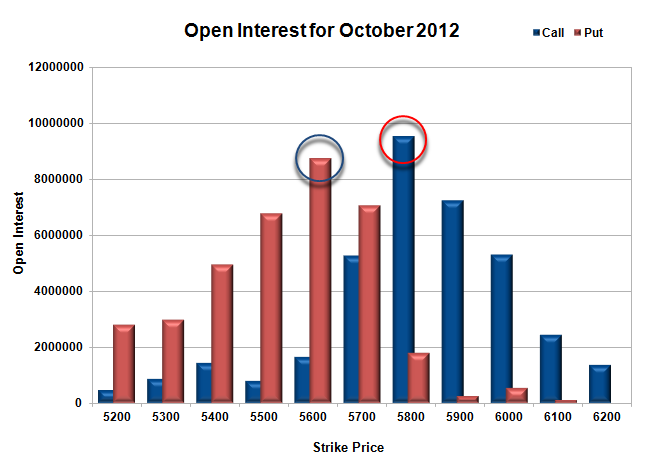 Put Option 5800-5600 added 26.64 lacs huge amount of OI, with profit booking seen at 5500 and below strike prices. Highest accumulation on Call option 5800 at 1.17 crore & 5900 at 59.5 lacs whereas Put option 5600 at 83.6 lacs & 5700 at 62.5 lacs. Nifty Open Interest is at 1,97,27,400 down by 24,73,900 whereas Nov series added 46.05 lacs with increase in price, most probably 100% rollover with huge long build-up. Bank Nifty Open Interest is at 10,71,625 up by 25,200 whereas Nov series added 1.35 lacs with increase in price, most probably huge long build-up. FII’s bought huge 4.05 lacs of Futures, most probably long build-up, as their Net OI also increased by 39.2lacs, and their average price per contract comes to around 5132. FII’s future open contract as on date is 701013. 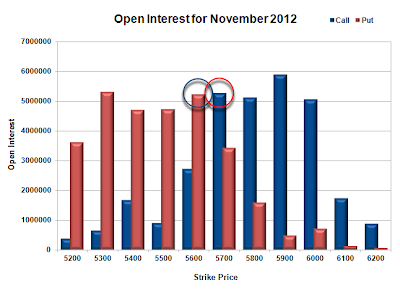 PCR Open Interest (Volume) is at 0.976 still comfortably below the danger level for the Bulls. 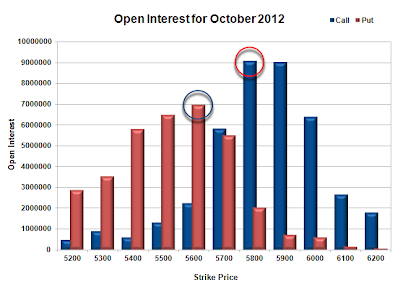 Initial support at 5700, with huge addition for the day at 7.74 lacs and below that at 5600 with OI above 83.6 lacs. Huge and only resistance right now at 5800 with highest OI of above 1.17 crore. Range as per Option Table is 5656 -5752 and as per VIX is 5678 - 5756 with 5700 as the Pivot. Nifty opened negative and remained so with steady decline towards the lows of the day around 5660, but a late buying saw the index close at 5684.25, still a good loss of 34.45 points. On a week on week basis Nifty ended flat with a gain of just 8.20 points and a ‘DOJI’. The OI Table rolled back whatever was done on Thursday, with huge addition at 5600-5700CE and short covering at 5700PE level. Call option 5600-5800 added 21.94 lacs huge amount of OI, with huge profit booking seen at 5900 and above strike prices. 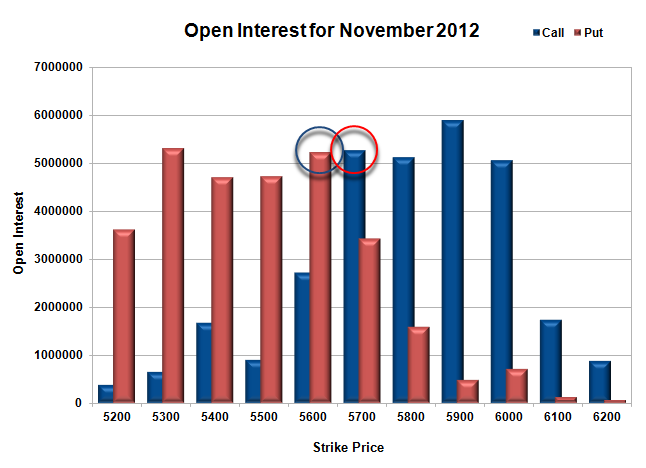 Put Option 5800-5600 covered 41.88 lacs huge amount of OI, with no addition seen at any strike price. Highest accumulation on Call option 5800 at 1.07 crore & 5700 at 61.9 lacs whereas Put option 5600 at 68 lacs & 5500 at 66.8 lacs. Nifty Open Interest is at 2,22,01,300 down by 20,52,350 whereas Nov series added 12.06 lacs with decrease in price, most probably 100% rollover with huge long liquidation. Bank Nifty Open Interest is at 10,46,425 down by 1,64,550 whereas Nov series added 65 thousand with decrease in price, most probably 100% rollover with huge long liquidation. FII’s sold huge 5.39 lacs of Futures, most probably short build-up, as their Net OI also increased by 1.53 lacs, and their average price per contract comes to around 5018. FII’s future open contract as on date is 622617. PCR Open Interest (Volume) again dipped below 1 due to huge liquidation at most PE levels and now at 0.914. Support at 5600, though have weakened due to huge liquidation for the day at 19.5 lacs but still OI above 68 lacs and below that at 5500 with OI above 66.8 lacs. 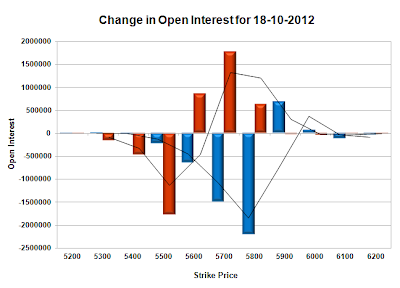 Resistance moved down to 5700 with huge addition for the day at 9.2 lacs and above that at 5800 with highest OI of 1.07 crore. Range as per Option Table is 5636 -5733 and as per VIX is 5641 - 5728 with 5690 as the Pivot. Nifty opened flat and stayed around the previous day close but huge buying in banking shares (some rumours of rate cut) saw the index moved up vertically above 5700 to end the day strong at 5718.70, a huge gain of 58.45 points. The OI Table saw huge addition at 5600 and 5700PE. Call option 5800 added 7.45 lacs huge amount of OI, with huge short covering seen at 5700 and below strike prices. Put Option 5800-5600 added 32.74 lacs huge amount of OI, with huge profit booking seen at 5500 and below strike prices. 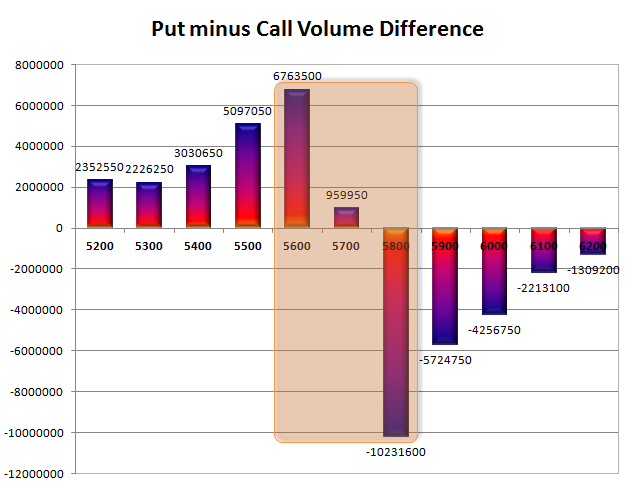 Highest accumulation on Call option 5800 at 95.3 lacs & 5900 at 72.6 lacs whereas Put option 5600 at 87.6 lacs & 5700 at 70.6 lacs. Nifty Open Interest is at 2,42,53,650 up by 5,05,100 with huge increase in price, most probably long build-up. 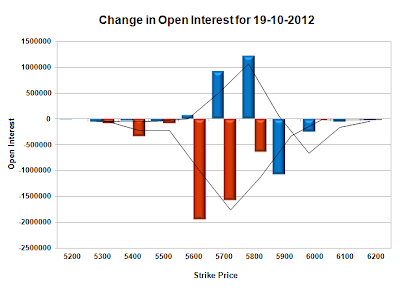 Bank Nifty Open Interest is at 12,10,975 up by 91,325 with huge increase in price, most probably long build-up. FII’s bought 1.03 lacs of Futures, most probably long build-up, as their Net OI also increased by 11.82 lacs, and their average price per contract comes to around 5052. FII’s future open contract as on date is 6.196 lacs. PCR Open Interest (Volume) made a jump above 1 and now above 1.049. 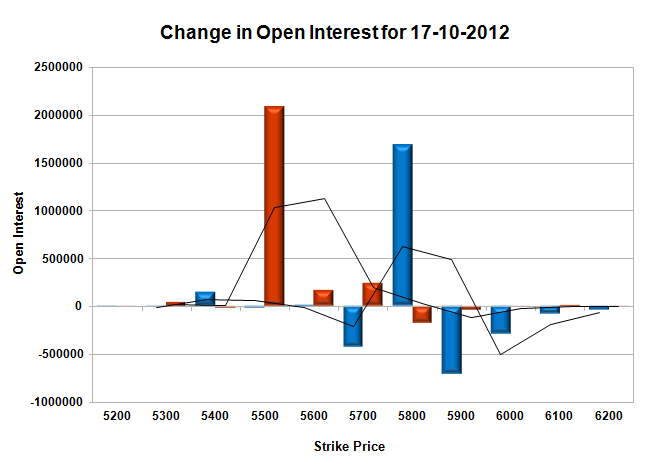 Support jumped up to 5700, with huge addition for the day at 17.8 lacs and below that at 5600 with OI above 87.5 lacs. 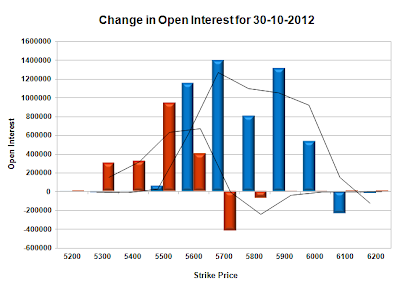 Resistance just shifted up to 5800 with highest OI of 95.3 lacs and above that at 5900 with OI of 72.6 lacs. Range as per Option Table is 5655 -5752 and as per VIX is 5675 - 5763 with 5700 as the Pivot. Nifty opened positive on the back of good global cues, but was sold off instantly below the previous day’s close. The index became sluggish thereafter within a very narrow range but saw buying in the dying minutes to close positive at 5660.25, a smallish gain of 12.25 points. The OI Table saw huge addition at 5500PE and 5800CE. Call option 5800 added 16.86 lacs huge amount of OI, with huge profit booking seen at 5900 and above strike prices. Put Option 5700-5500 added 24.93 lacs huge amount of OI, with huge short covering seen at 5800 and above strike prices. Highest accumulation on Call option 5800 at 1.17 crore & 5700 at 67.7 lacs whereas Put option 5500 at 85.5 lacs & 5600 at 78.9 lacs. Nifty Open Interest is at 2,37,48,550 down by 2,88,950 with small increase in price, most probably long liquidation or short covering. Bank Nifty Open Interest is at 11,19,650 down by 26,525 with small increase in price, most probably long liquidation. FII’s bought huge 3.84 lacs of Futures, most probably long build-up, as their Net OI also increased by 0.22 lacs, and their average price per contract comes to around 4971. FII’s future open contract as on date is 5.959 lacs. 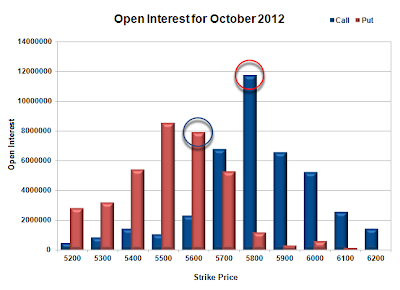 PCR Open Interest (Volume) just moved up to 0.935 on the back of huge addition at 5500PE. 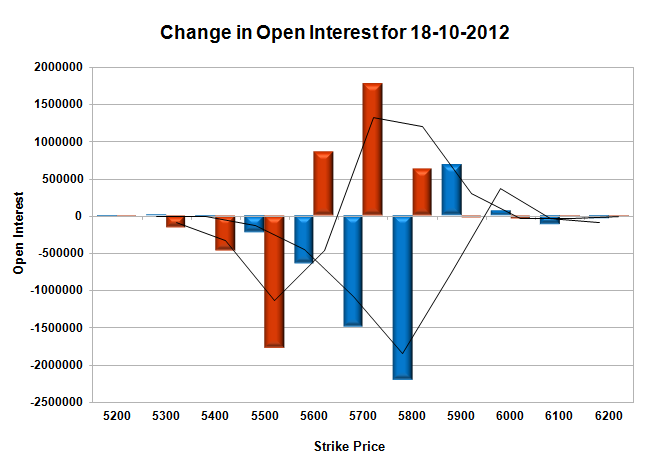 Support still very good at 5600, with net OI above 78.9 lacs and below that at 5500 with OI above 85.5 lacs. Initial resistance still at 5700, though covered some but net OI above 67.7 and above that at 5800 with highest OI of 1.17 crore. 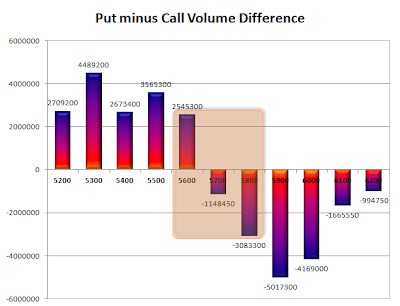 Range as per Option Table is 5614 -5707 and as per VIX is 5615 - 5705 with 5670 as the Pivot. Nifty opened positive on the back of good global cues and hovered around 5700 for the better part of first half, but Europe open saw huge sell-off to the lows of the day at 5635. Nifty ultimately closed around the lows at 5648.00, loss of 39.25 points. 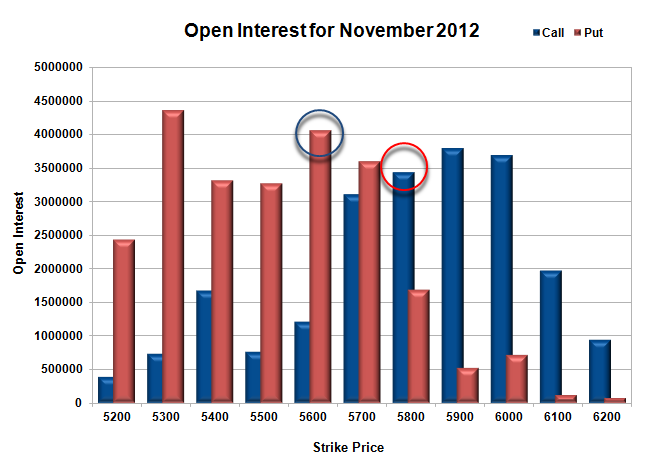 The OI Table saw huge addition at 5700 and 5800CE. Call option 5600-5800 added 23.60 lacs huge amount of OI, with huge profit booking seen at 5900 and above strike prices. 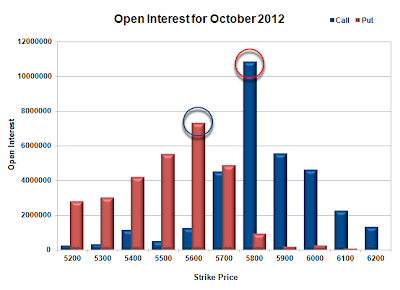 Put Option 5600-5500 added 4.55 lacs huge amount of OI, with huge short covering seen at 5700 and above strike prices. Highest accumulation on Call option 5800 at 1.01 crore & 5900 at 72.9 lacs whereas Put option 5600 at 77.3 lacs & 5500 at 64.7 lacs. Nifty Open Interest is at 2,40,37,500 down by 5,70,200 with huge decrease in price, most probably huge long liquidation. Bank Nifty Open Interest is at 11,46,175 down by 35,275 with decrease in price, most probably huge long liquidation. FII’s sold huge 2.35 lacs of Futures, most probably long liquidation, as their Net OI also decreased by 6.23 lacs, and their average price per contract comes to around 4960. FII’s future open contract as on date is 5.955 lacs. 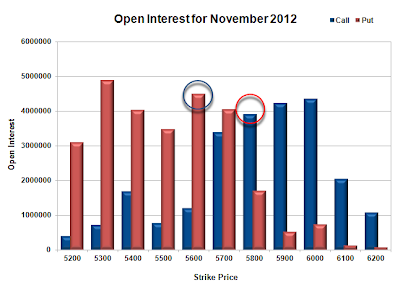 PCR Open Interest (Volume) is decreasing fast and now at 0.884. 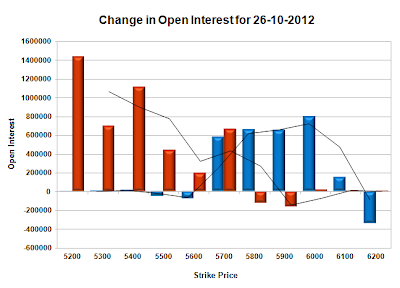 Support still very much at 5600, with net OI above 77.3 lacs and below that at 5500 with OI above 64.7 lacs. Initial resistance now at 5700 with huge addition for the day at 14.23 lacs and net OI above 72 and above that at 5800 with highest OI of 1 crore. 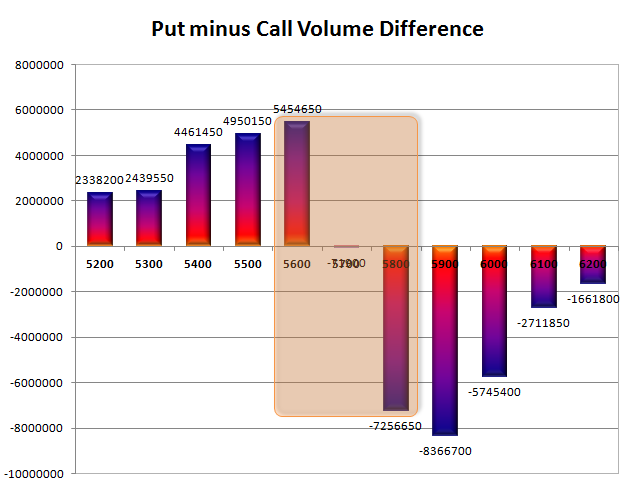 Range as per Option Table is 5615 -5714 and as per VIX is 5602 - 5694 with 5670 as the Pivot. Nifty opened negative below the previous day’s close and languished around the lows for the better part of the morning session. After Europe opened, Nifty made a dash towards 5700, but was not able to conquer it and closed just below at 5687.25, a small gain of 11.20 points. The OI Table saw huge addition at 5600PE, which now looks like a very valid Support, resistance still very much at 5800. 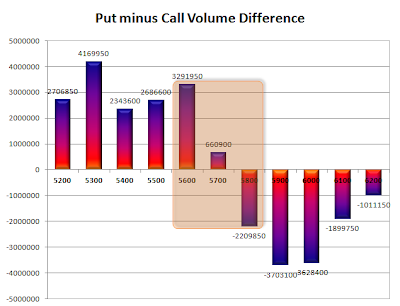 Call option 5400, 5800, 6100 added 10.28 lacs huge amount of OI, with small profit booking seen at 5900 and above levels. 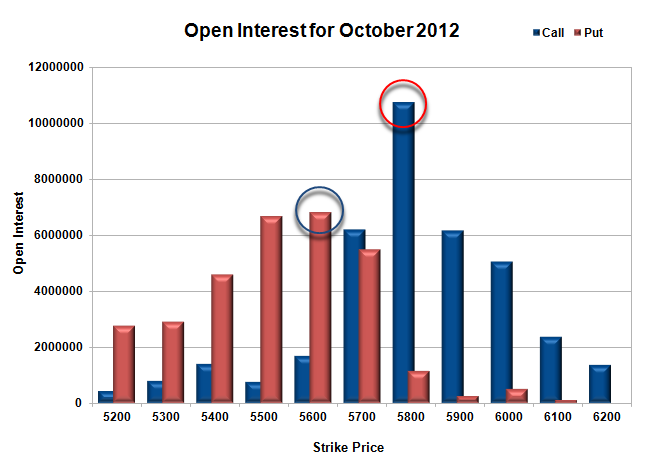 Put Option 5700-5600 added 9.22 lacs huge amount of OI, with huge profit booking seen at 5500 and lower strike prices. 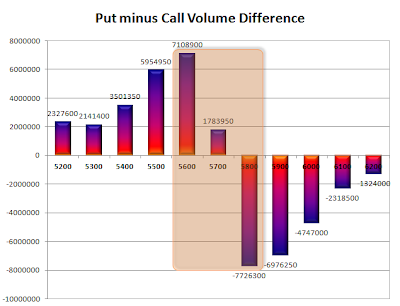 Highest accumulation on Call option 5800 at 91.8 lacs & 5900 at 88.1 lacs whereas Put option 5600 at 76.9 lacs & 5500 at 60.5 lacs. Nifty Open Interest is at 2,46,07,700 down by 2,63,350 with increase in price, most probably huge short covering. 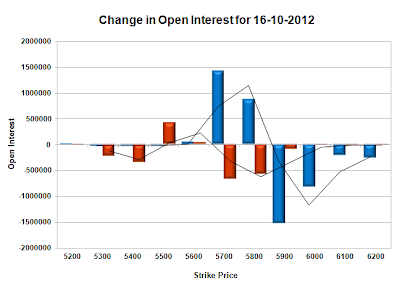 Bank Nifty Open Interest is at 11,81,450 up by 17,625 with increase in price, most probably huge long build-up. FII’s bought huge 6.50 lacs of Futures, most probably long build-up, as their Net OI also increased by 2.03 lacs, and their average price per contract comes to around 5024. FII’s future open contract as on date is 6.079 lacs. PCR Open Interest (Volume) decreased to 0.908 due to huge profit booking seen at 5500 and below PE levels. Best Support at 5600, with huge addition for the day at 7.19 lacs and net OI above 76.9 lacs and below that at 5500 with OI above 60.5 lacs. Rock solid Resistance still remains at 5800 with highest OI in Option Table at 91.8 lacs and above that at 5900 with OI above 88.1 lacs. 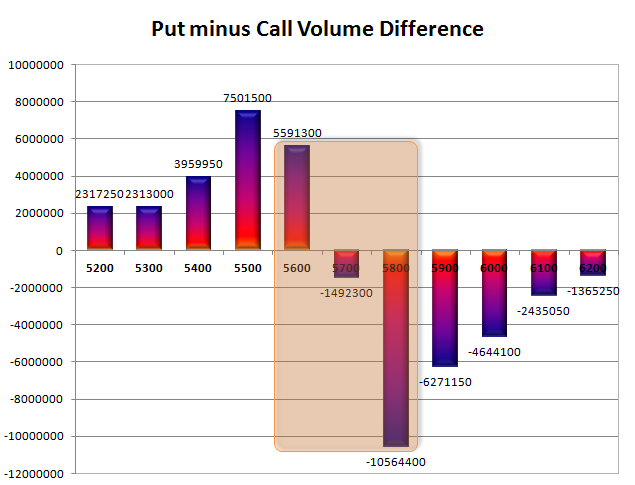 Range as per Option Table is 5634 -5728 and as per VIX is 5640 - 5735 with 5690 as the Pivot. Nifty opened negative below 5700, but made a dash above 5720 within the first 2 hrs of trade, but after the IIP data was announced, which grew at 2.7% in August against a dismal -0.2% in July, the market corrected to the lows of the day to close at 5676.05 a loss of 32.00 points. On a week on week basis the market lost 70.90 points or about 1.23%. 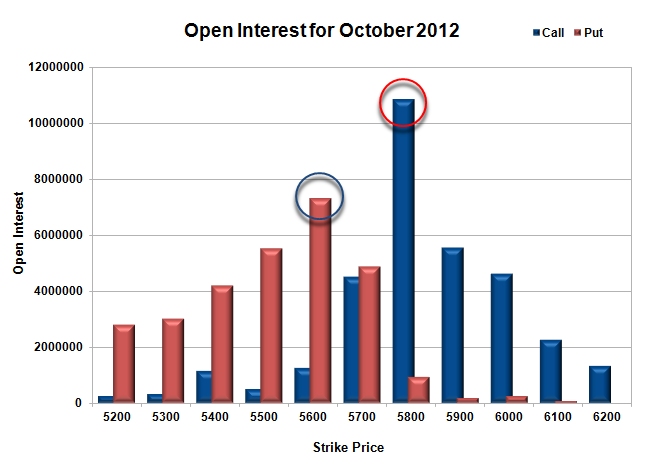 The OI Table saw huge addition from 5700-5900CE levels and now 5800 & 5900 CE strike have more than 90 lacs OI. 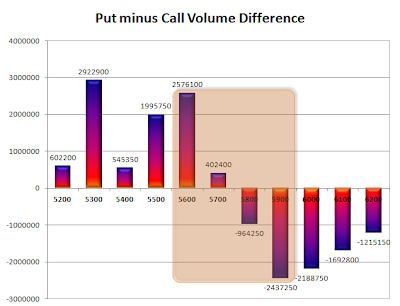 Call option 5860-5900 added 25.16 lacs huge amount of OI, with small profit booking seen at 6000 level. Put Option 5700, 5500-5300 added 11.43 lacs huge amount of OI, with huge short covering seen at 5800 and above strike prices. Highest accumulation on Call option 5800 at 90.7 lacs & 5900 at 90.2 lacs whereas Put option 5600 at 69.7 lacs & 5500 at 64.9 lacs. 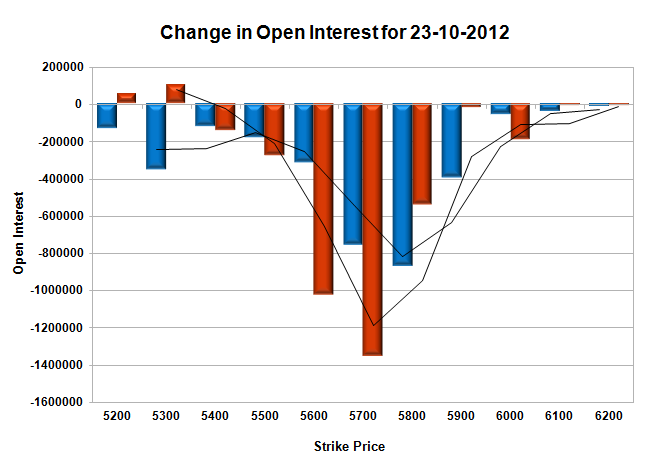 Nifty Open Interest is at 2,48,71,050 down by 4,98,650 with decrease in price, most probably huge long liquidation. Bank Nifty Open Interest is at 11,63,825 down by 58,375 with decrease in price, most probably huge long liquidation. FII’s sold huge 5.62 lacs of Futures, most probably long liquidation, as their Net OI also decreased by 5.97 lacs, and their average price per contract comes to around 5107. FII’s future open contract as on date is 6.039 lacs. PCR Open Interest (Volume) is decreasing by the day and now at 0.919. Best Support at 5600, with huge OI above 69.7 lacs and below that at 5500 with OI above 64.9 lacs. Rock solid Resistance at 5800 with highest OI in Option Table at 90.7 lacs and above that at 5900 with OI above 90.2 lacs. 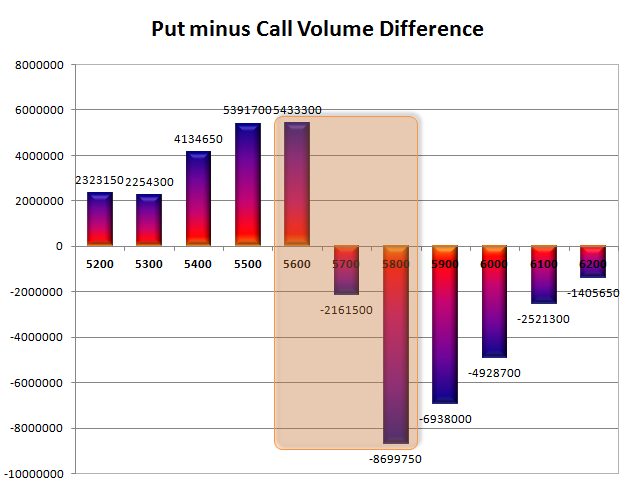 Range as per Option Table is 5638 -5733 and as per VIX is 5627 - 5725 with 5690 as the Pivot.